Santabarbaraite: Mineral information, data and localities. Named in 2000 by Giovanni Pratesi, Curzio Cipriani, Gabriele Giuli, and William D. Birch for the type locality in the Santa Barbara mining district, Valdarno, Tuscany, Italy. St. Barbara (4th century) is the patron saint of miners. Consists of x-ray amorphous replacements of vivianite as well as smooth botryoidal crusts. Pseudomorphs of vivianite or botryoidal crusts. X-ray amorphous; Partial replacements said to contain poorly crystalline vivianite, but the analogy to the phosphate analog of parasymplesite are unsupported by data. 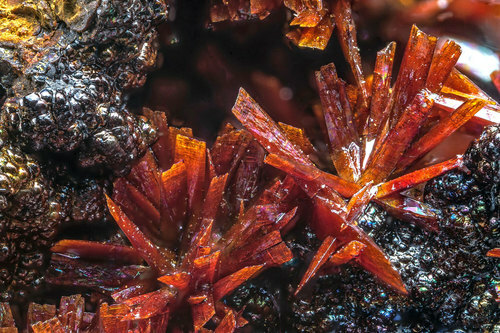 resinous botryoidal masses and waxy to resinous replacements of vivianite. Vivianite 1 photo of Santabarbaraite associated with Vivianite on mindat.org. Pratesi, G., C. Cipriani, G. Giuli. & W. Birch (2003): "Santabarbaraite: a new amorphous phosphate mineral", European Journal of Mineralogy: 15: 185-192. The following Santabarbaraite specimens are currently listed for sale on minfind.com. 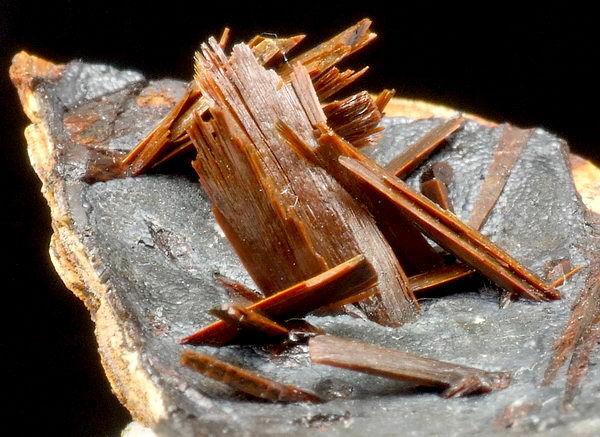 FRANSOLET, A.-M., OUSTRIERE, P., FONTAN, F. & PILLARD, F. (1984) La mantiennéite, une nouvelle espèce minérale du gisement de vivianite d'Anloua, Cameroun. Bulletin de Minéralogie 107, 737-744. Ponomarev, V.S., Erokhin, Yu.V., Pekov, V.I., and Chukanov, N.V. [Пономарув, В.С., Ерохин, Ю.В., Пеков, В.И., и Чуканов, Н.В.] 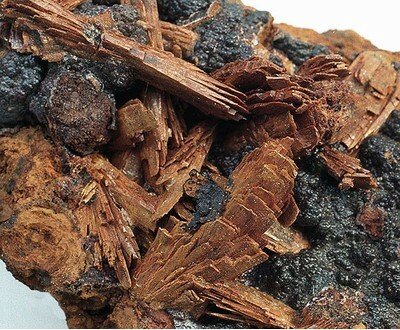 (2017) Santabarbaraite from the oxidation zone of the Mednorudyansk field is the first finding in the Urals [Сантабарбараит из зоны окисления Меднорудянского месторождения - первая находка на Урале]. News of the Ural State Mining University [Известия Уральского Государственного Горного Университета], 4 (48), 36-41 (in Russian). Fagel, N., Alleman, L.Y., Granina, L., Hatert, F., Thamó-Bozsó, E., Cloots, R., and André, L. (2005) Vivianite formation and distribution in Lake Baikal sediments. Global and Planetary Change, 46, 315–336; Ponomarev, V.S., Erokhin, Yu.V., Pekov, V.I., and Chukanov, N.V. [Пономарув, В.С., Ерохин, Ю.В., Пеков, В.И., и Чуканов, Н.В.] (2017) Santabarbaraite from the oxidation zone of the Mednorudyansk field is the first finding in the Urals [Сантабарбараит из зоны окисления Меднорудянского месторождения - первая находка на Урале]. News of the Ural State Mining University [Известия Уральского Государственного Горного Университета], 4 (48), 36-41 (in Russian).